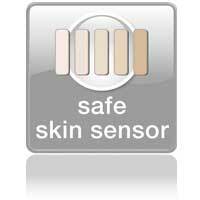 Before each light pulse, our skin type sensor measures the skin pigmentation at the area being treated. 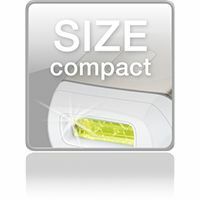 The IPL 7000 is a light-based device for lasting hair removal for private use. The light-based hair removal process is a well-known and proven method. 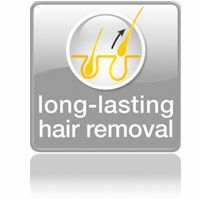 In 15 years of clinical applications around the world, it has proven to be a safe and effective method for achieving lasting hair reduction. energy (heat), which ultimately deactivates hair growth. Does the device technology really work? Yes. In clinical tests performed by doctors, it was proven that the technology in the device can be used to safely achieve lasting hair removal results. How long does a treatment session last using the device? The time can vary depending on the area of the body being treated. A full body treatment (legs, arms, armpits, bikini zone and face below the cheekbones) takes approximately 20 minutes at the lowest intensity level. As the device is operated using electricity, it can be used for as long as is necessary to perform a full hair removal session on the desired area(s) of the body. Is the device painful to use? When used correctly, most users of the device report a slight warm feeling when the light pulse is issued. Users with thicker and darker hair may experience slightly more discomfort, however this subsides once the hair removal session is complete. The device has three power settings, which you can select depending on the sensitivity of your skin. How often should I use the device? In the case of body hair treatment with the device, the first four sessions should be performed two weeks apart. The fifth to seventh sessions inclusive can be performed four weeks apart. Any further sessions should be performed if the hair has grown back until the desired results have been achieved. In the case of treatment of hair on the face below the cheekbones, the first six sessions should be performed two weeks apart. The seventh to twelfth sessions can be performed four weeks apart. Any further sessions should be performed if the hair has grown back until the desired results have been achieved. When can I expect to see noticeable results? of these hairs will simply fall out after two weeks. Additionally, hair grows in three different stages and the device only has an effect on the hairs in the active growth phase. This is one of the main reasons why multiple sessions are necessary to achieve the desired result. Is the device also suitable for use by men? Men must not use the device on their facial hair. Although the device was developed for women, it may also be suitable for use by men. However, men’s hair – typically on the chest – will require more hair removal sessions than women do to achieve the desired results. Is long-term usage of the device bad for my skin? The use of light and laser energy in aesthetic medicine has been excessively documented for over 15 years in professional journals that are checked by experts, and by reputable institutions such as the Mayo Clinic. These journals and institutions have not reported any side effects or damage as a result of long-term use of light- and laser-based devices. After unprotected exposure to the sun, how long should I wait before performing a treatment with the device? You should wait two weeks after unprotected exposure to the sun before using the device. If you are still unsure about exposure to the sun, you should consult your doctor. Are there any particular steps I need to take before using the device? with mild soap and water and the hair should be shaved down to the surface of the skin.